Released on November 19th 2001 this is a nice release which documents John's early 1980s fresh electric band sound and features Jeff Allen on drums and Alan Thomson playing bass and keyboards. Eleven songs in total with perhaps the most interesting being a live rendition of Anna. Anna was written by John as the theme tune to the Australian film In Search Of Anna which was released in 1978. The song was released in Australia as a single but only sold in very small numbers and is extremely rare. 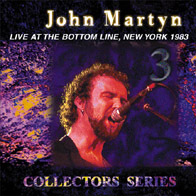 This is the first time that a live version of Anna (as John titles the song) has become available on general release.